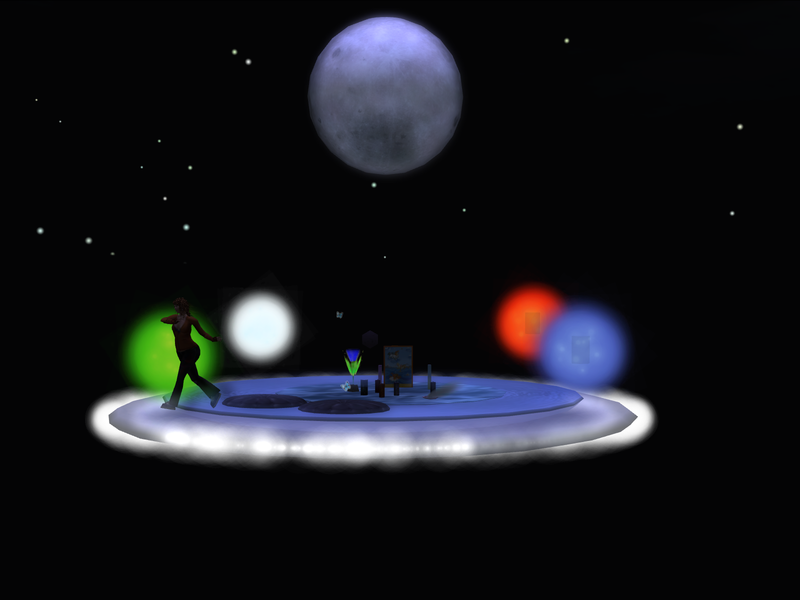 Dancing in my Moon Temple. Things settled down in the Anam Turas group, with regular Sunday morning Open Pagan Discussions, Tuesday night healing ritual, and Friday evening Tarot discussions. In fact, it got a touch boring making my weekly rounds. Then, due to scheduling conflicts, the Tarot discussion stopped. The Tuesday healing ritual got a little spotty. I thought the group was pretty much over. Before I could give up completely, Aoife Lorefield started an astrology discussion. This wasn’t generic what’s-your-sign stuff. There was deep planetary tracking interpreted by Aoife’s penetrating insights. Before each new moon we learned about that month's particular astrological focus for “Yin Intentions”, or wishes. She created the Rising Moon group for moon location updates. New moon rituals were held. I’ve had varied results with the New Moon Wishes. Usually about half of my wishes come true. One month I got all of my wishes! On the down side, for six months I’ve been waking up when the full moon is directly overhead. Its an inconvenient yet nice-to-have energetic connection. Hopefully I’ll get a notion about how to use that energy. 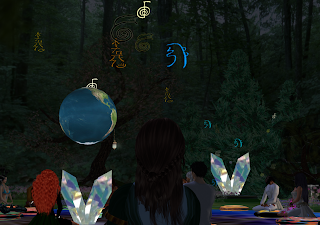 About the time Aoife started her group, ConnieJean Maven came along with a Reiki Meditation Healing Ritual and spun off another group, United Healers of Second Life.The Anam Turas healing circle involved dancing and heavy emoting. ConnieJean’s ritual involved quiet, seated meditation on pads laid out in an energy grid. I found the contrast instructive and learned to recognize energy whether active or passive. 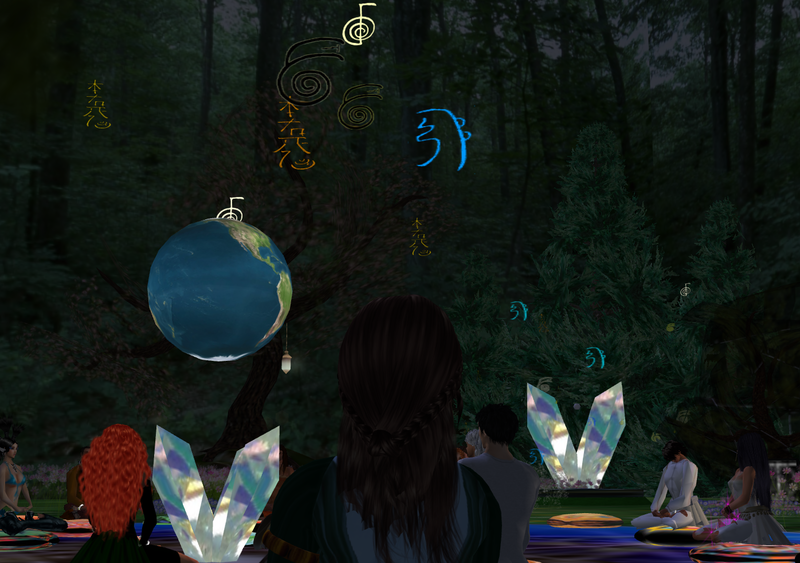 The first time I took part in the meditative healing circle I was filled with calming energy for days afterwards. The second time, the first life people whose names I placed in the healing circle were healed and energized. As a bonus, the good energy I had sent out came back to me. And that keeps on happening. There was also a chakra healing meditation focusing on the throat chakra. The next day I was talking my head off. The Anam Turas Tuesday night healing circles have returned. Although the scheduling has been a bit bumpy over the holidays, the Rising Moon meetings and United Healers circles are still happening. All of the groups are open groups. You should be able to find them with in-world search. Join up and try the energy. You could have a better New Year.